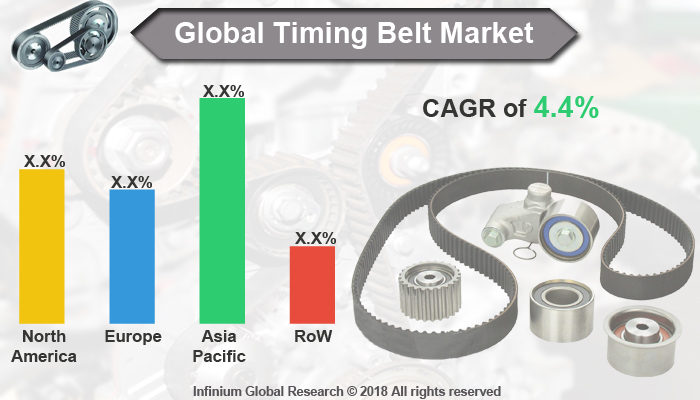 A recent report published by Infinium Global Research on timing belt market provides in depth analysis of segments and sub-segments in global as well as regional timing belt market. The study also highlights the impact of drivers, restraints and macro indicators on the global and regional timing belt market over the short term as well as long term. The report is a comprehensive presentation of trends, forecast and dollar values of the global timing belt market. According to the report, the global timing belt market is projected to grow at a CAGR of 4.4% over the forecast period of 2018-2024. The timing belt is the belt that controls the camshafts in your engine along with opening and closing valves at just the right time for smooth operation of the car. However, the use of a timing belt as an alternative of direct gear drive allows engine designers to keep the camshaft away from the crankshaft. In modern engines, manufacturers recommend replacing the timing belt from between every 40,000 – 150,000 kilometers depending on the engine. The major advantage of using the timing belt is that the Power transmission efficiency is not lost with regular use and there is no need for lubrication as the operation of the timing belt is very clean. Some cars and trucks use timing chains or gears that are more durable. However, timing belts, made of rubber compound are quieter and more efficient. They also do not need lubricants to work. The factors such as an increased preference for high mileage vehicles and increased Vehicle Parks are driving the growth of the timing belt market. Increased demand for automobiles from emerging countries such as BRIC countries is strengthening the growth of the timing belt market. Additionally, growth in direct injection engines is likely to escalate the demand for automotive timing belts. However, the demand for pure battery electric vehicles is restraining the growth of the timing belt market. Furthermore, the shift from dry belt to belt in oil timing belt is anticipated to create several growth opportunities for the key players in the timing belt market over the years to come. Participation in racing events is on the rise, the market for high-performance vehicle is very promising. This, in turn, is projected to boost the overall demand for timing belt during the forecast period. Automotive timing belt manufacturers, as well as OEMs, are exploring various research and development activities to intensify the durability and life of automotive timing belts. The Asia Pacific Prevailed to be the largest market for the automotive timing belts and chains due to the growing vehicle production in China followed by India. China and India are among the fastest growing markets in the world for automotive manufacturing and accessories manufacturing owing to low production costs. Increasing production of automobiles in the European region has led to an increasing demand for the automotive timing belts. Moreover, the global automobile industry has undergone several structural changes such as technological changes in the engines, electrification of automobiles, emission norms and regulations, safety and security changes, and connectivity among others. Overview of hybrid vehicles has led to substantial changes in the internal structure and functioning of the vehicles. This has resulted in the strategic developments in the global automotive market. The report on global timing belt market covers segments such as drive type, vehicle type, hybrid vehicle type, and component. On the basis of drive type, the global timing belt market is categorized into belt-in-oil, dry belts, and chains. On the basis of vehicle type, the global timing belt market is categorized into passenger vehicle and commercial vehicle. On the basis of hybrid vehicle type, the global timing belt market is categorized into a plug-in hybrid electric vehicle (PHEV) and hybrid electric vehicle (HEV). On the basis of the component, the global timing belt market is categorized into idler pulleys, timing shield, tensioner, and sprocket. The report provides profiles of the companies in the global timing belt market such as NTN, Goodyear, Fenner, Schaeffler, Tsubakimoto, Continental, Aisin, Toyoda, SKF and BorgWarner. The report provides deep insights into demand forecasts, market trends, and micro and macro indicators. In addition, this report provides insights into the factors that are driving and restraining the global timing belt market. Moreover, IGR-Growth Matrix analysis given in the report brings an insight into the investment areas that existing or new market players can consider. The report provides insights into the market using analytical tools such as Porter's five forces analysis and DRO analysis of timing belt market. Moreover, the study highlights current market trends and provides forecast from 2018-2024. We also have highlighted future trends in the timing belt market that will impact the demand during the forecast period. Moreover, the competitive analysis given in each regional market brings an insight into the market share of the leading players. This report will help manufacturers, suppliers, and distributors of the timing belt market to understand the present and future trends in this market and formulate their strategies accordingly.